In The Running Dream, Jessica the sprinter learns that life is indeed a marathon and not a sprint. Jessica loses her leg after a tragic car accident. Jessica lives to run - she starts her day with a long run with her dog and she ends her day with track practice. Without her leg, she may still be alive, but her life is over. The author does a wonderful job of portraying the physical and emotional aftermath of losing a limb, especially for someone who defines herself by her physical abilities. Jessica does not wake up from the hospital geared up and ready to start her new life. Of course not. Who would? She's despondent. Then she's angry. Then she's sulky. She basically goes through the classic steps of grief. Additionally, it is fascinating to learn about the physical aspects of losing a limb. The idea of phantom limb pain is explored as well as many details about prosthetic limbs. The reader is entertained while subconsciously educated. When Jessica goes back to school she can't fit beneath a desk in her wheelchair, so she is assigned to sit with Rosa, who has cerebral palsy. Rosa has always been there, but she was invisible to the healthy, happy Jessica. Just like she is invisible to everyone, inside and outside of school. They develop a slow friendship. At first, Jessica is mostly just being polite to Rosa, but soon she discovers she truly cares for Rosa and looks beyond her disability. I love how Rosa was portrayed. She was not just a kid with cerebral palsy. She was a math genius. She was funny, caring, and thoughtful. She wanted more out of life. Physical disabilities are so rarely portrayed in YA literature. The author did a wonderful job in creating a character who was only partially defined by her disability. Slowly, Jessica starts to heal, physically and emotionally. Rosa was a big part of that process. Jessica realizes that she is lucky in a way Rosa can never be. She can walk again - with a prosthetic limb she can even run again. She has tons of friends and supporters. She will never be invisible. Jessica heals not only for herself, but for her family, her friends, and for Rosa. There is a little romance in this book. It's really a side plot. Perhaps thrown in there to meet the quasi-requirement of a crush in a YA novel. While it wasn't necessary, it was sweet and moved the book along. Wendelin's prose was excellent. The book moved quickly and smoothly. The prose was simple yet elegant. You really felt Jessica's emotions and healed alongside her. At the same time, it didn't go overboard. It never felt like trumped up drama. I could easily be stepping into a real person's life, thoughts, and emotions. 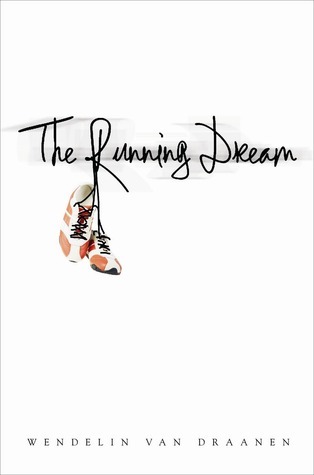 The Running Dream is a well-written, enjoyable novel. It is a serious book, but will leave you feeling uplifted. Oh, I really liked this one! Of course, I do love this author--her writing is just so smooth. It's on my to-be-reviewed pile! Thanks for your great review. This sounds like a great book, Alison. I don't mind a serious novel in once in a while, but I'm glad to hear that it left you feeling uplifted. I'm adding it to my tbr pile. Thanks for a great and thorough review! I really enjoyed this one too--very powerful. This sounds like a really lovely book. I can't wait to read it - excellent review. Wow this book sounds amazing! I love that her healing is definitely a process, and she doesn't wake up from losing a limb, pout for just a few days, and then decide everything will be fine. I like a more realistic portrayal like this where it takes time and there's anger, and pain and grief just like you said. Fabulous review Alison! Uh, I love your review! :) When I came across this novel in a store I wouldn't consider buying it, but you make it sound like a fantastic read!I appreciate well-written books with a serious and emotional story. I'm glad to hear a good review. This is the first review I've read. I checked out a sample on my Kindle. I really liked it! I want to read this book. It's so nice to have books about different characters, especially the disabled, then the usual standard ones. I'm teary eyed here. You are right, there aren't many YA books that explore these issues. And the realistic portrayal of Jessica's struggles seem not only well done but informative, as you mentioned. Thanks for your review, Alison. I've seen the cover for this one around, but never stopped to read what it was about.